The Hammersmith Apollo has been host to an array of acts over its 79-year life span. Its walls are a myriad of fame with signed pictures from Kylie to Kasabian making up the decor. However this week a very different performance graced the Apollo stage. 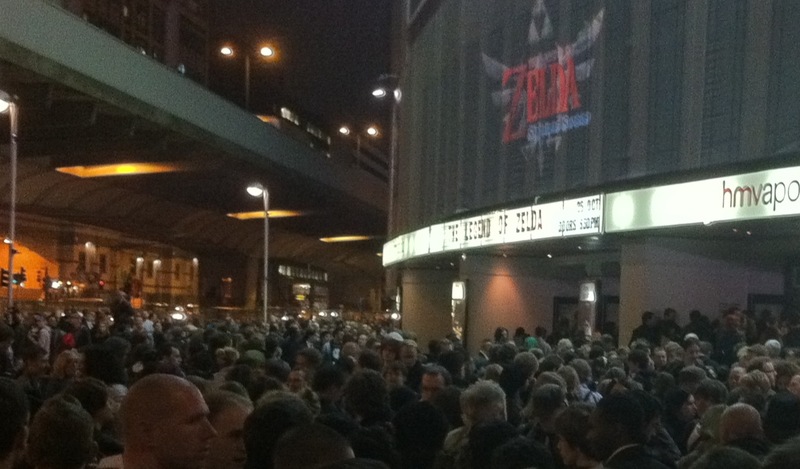 The magic of one of the most successful video game franchises ever seen descended upon London for the closing night of the Legend of Zelda 25th Anniversary Symphony Concert. The evening was hosted by none other than Robin Williams daughter, Zelda Williams. Yes, her namesake is due to her fathers’ love of the series, or so we are told. After relaying quips about her favourite Ocarina melody, Ms Williams introduced Nintendo legend Eiji Aonuma on stage to drum up the crowd. Having worked on the Zelda series for over 13 years, the crowd hung onto his every word, creating a cacophony whenever the “Z word” left his lips. However, Aonuma was keen to divert applause to the excellent orchestra. Conducted by Eimear Noone, the Royal Philharmonic Concert Orchestra were a truly astounding outfit. They are also no strangers to performing video game themes, as they were part of the Star Wars: A Musical Journey tour in North America. Starting off with Hyrule Castle Theme, it was immediately apparent that we were in for a treat. Hearing familiar tunes that have been drummed into you for hours on end as you tried to reach Gerudo Valley performed by a full orchestra was amazing. Akin to when you ditch your iPod earphones for some proper headphones, all manner of audio nuances were revealed. After showcasing their talents on the Wind Waker Theme and a delicate rendition of Princess Zelda’s Theme, the orchestra introduced themselves section by section, each performing an ocarina melody. Then we were off again as they plunged into Boss Battle Medley, whilst simultaneously a visual medley of boss battles from throughout the series were displayed. One criticism may be that the music focused too much on Ocarina of Time and Wind Waker. There wasn’t a sniff of Majora’s Mask, despite being the Zelda game that allowed you to transform into all manner of musicians. This was of course overshadowed by the quality of the performance. The orchestral expertise perfectly brought the video game score to life – at the front of the arrangement were two harpists whose recital of Great Fairy’s Fountain Theme was astounding. Despite the performance being lauded as a celebration of 25 years of Zelda, there was no doubt this evening was also used as a way to plug the upcoming Skyward Swords game. Eiji Aonuma was keen to stress that a copy of the evening’s performance will be packaged with the new game. However, when given the opportunity to test the last Wii Zelda game, it looked decidedly long in the tooth. Although if it’s packaged with a CD of this quality, I think I’ll be buying it anyway.